If this card is Link Summoned: You can discard 1 card, then target 1 Spell/Trap in your GY; Set it to your field, but it cannot be activated this turn, then, if this card was co-linked when this effect was activated, you can draw 1 card. You can only use this effect of “Knightmare Gryphon” once per turn. Special Summoned monsters on the field cannot activate their effects, unless they are linked. Great Boss Monster is Great. 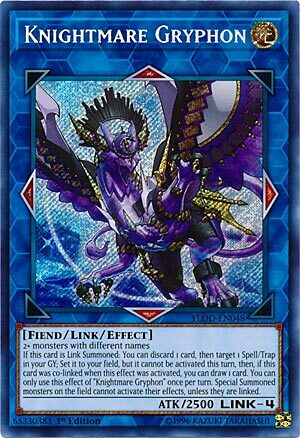 Knightmare Gryphon is a Link 4 Light Fiend-type Link Monster with 2500 Atk and Up, Down, Left, and Right Arrows. It still only requires monsters with different names, at least 2 or more. Like everything else this week, if it’s co-linked when you Link Summon it you get to draw a card in addition to setting a Spell or Trap from your grave that cannot be activated this turn. Some of the best protection is Gryphons ability to state that only Linked Special Summoned monsters can activate their effects. This does nothing to Hand or Grave monster effects, but it can still completely block a bunch of decks from doing anything. And it has decent attack. Knightmares are all splashable in the Extra Deck and can gain you draw effects. Definitely worth owning a set of all of them. We end this week off with the boss Knightmare monster, Knightmare Gryphon. Gryphon is a Link-4 LIGHT Fiend that requires 2+ monsters with different names, has 2500 ATK, and arrows pointing Up, Down, Left, and Right. Arrows are probably the best possible for co-linking and Extra Linking. 2500 ATK is good on a Link-4, though might be the bare minimum currently. LIGHT is a great attribute and Fiend is a good type. When Gryphon is Link Summoned, you can discard a card to set a Spell/Trap from your GY but it cannot be activated this turn and then draw 1 card if this is co-linked. This is a hard once per turn effect for Gryphon. This can be a great way to revive a power Spell or Trap like Monster Reborn or a Solemn, even if it can’t be used immediately in the case of a Spell. While you control Gryphon, Special Summoned monsters cannot activate their effects unless they are linked. Basically put it, a monster has to point to it to use its effect or a Link monster has to point to a monster. This can be an annoying way to lock out Special Summoned monsters’ effects. Your opponent has to Link Summon to use effects of monsters the Special Summon unless you have an arrow pointing on their field, which you shouldn’t do with this. Gryphon has a nice floodgate effect to help complete the Knightmares. I know we didn’t look at Mermaid or Unicorn this week, but until we do, just know they are also really good. Gryphon is worthy of being the boss Knightmare, though. Art: 4.5/5 Maybe my favorite Knightmare art. They are all outstanding, though. Closing the week is the big daddy, Knightmare Gryphon. Light attributed Fiend (my favorite type of Fiend) with 2500 attack for a Link 4 (only getting better here) with arrows to all four main zones (immediately to the left and right, as well as directly above and below, so perfection) and still Link Summoned with 2+ Monsters differently named. So, the discard/draw mechanic is still in full swing here. But it doesn’t destroy anything this time, it recycles a Magic or Trap card from your Graveyard, which you then Set back on your Field, although you can’t activate it that turn. Still dependent on being co-linked, no surprise or difficulty with this though, as it’s central to the theme. Also worth noting, it’s still appropriately a once per turn effect. Finally, instead of a protection effect, it has a soft lock effect on Special Summoned Monsters, where they cannot activate their effects unless they are linked. Which only makes the arrows on this card all the more valuable to you. It won’t be a problem for you AT ALL. It could prove to be quite a pain for the opponent though.